Oh, what? You haven't already gathered that I'm a total badass in this quick exchange we're having at this unassuming networking event? Fine, then. 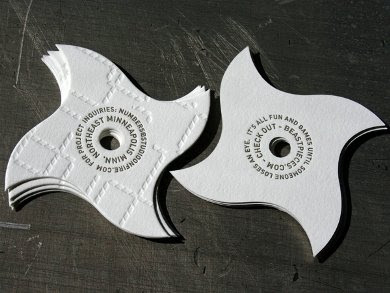 Allow me to fling my letterpress ninja business card at you while you cover your eyes in fear. LOVE. If & when I order personal calling cards, I want them to be just like this. Awesomeness.